I was imaging the Heart and Soul nebulae in Cassiopeia in the early hours of August 12 - the peak of the Perseid shower and noticed a very bright streak in one of my subexposures. 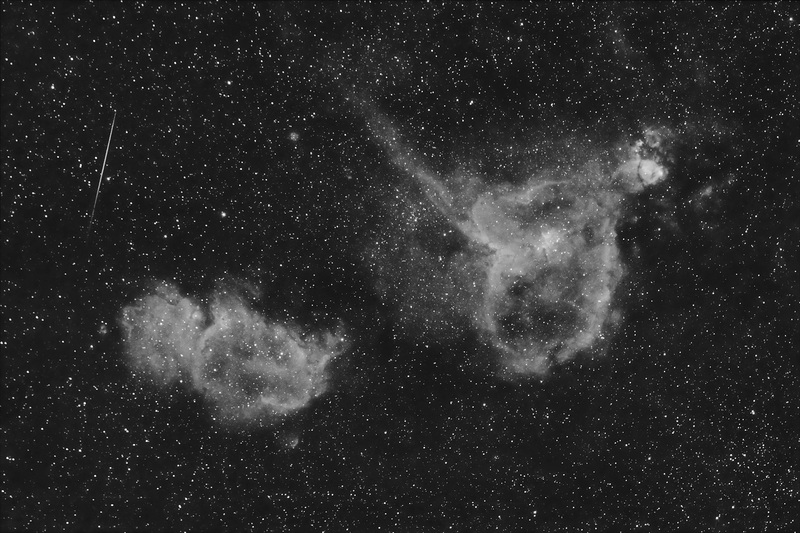 I was imaging in Hydrogen Alpha, so I had a very restrictive filter attached. The Perseid in question must have been a very bright meteor indeed. 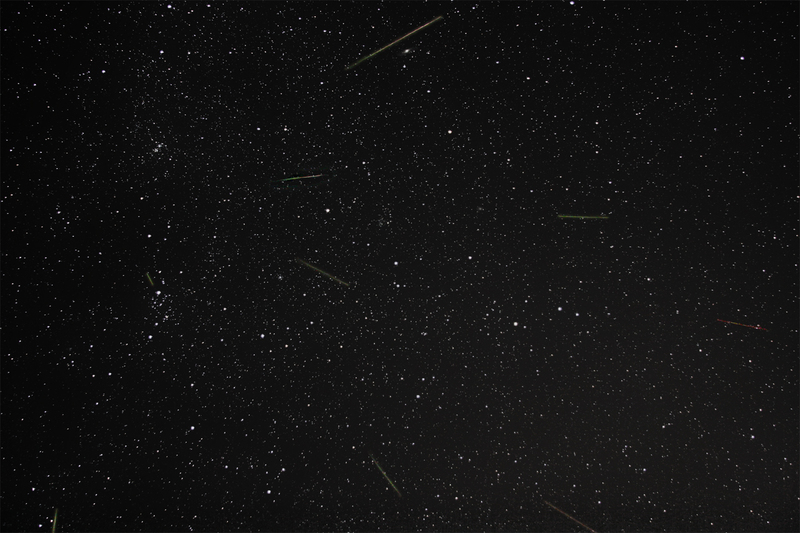 This is a composite video allsky image of 232 meteors collected over four nights. 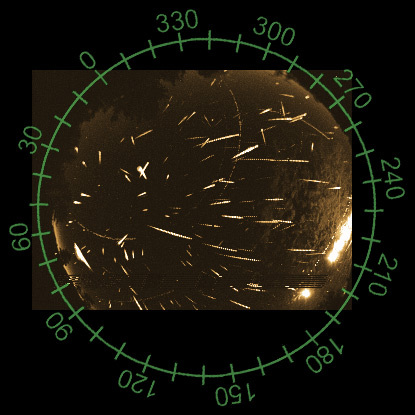 152 of the meteors were recorded on August 11/12, during the Perseid peak. Also included is a typical fireball video. I found this year's Perseid shower to be short on really bright fireballs. Usually, (and I base this on 35 years of Perseid watching) there are at least one or two "shadow-casters" on the night of maximum activity, but I saw none this year. There were dozens of faint-to-moderately-bright ones, though. Sometimes, there would be brief flurries of 6 meteors per minute. 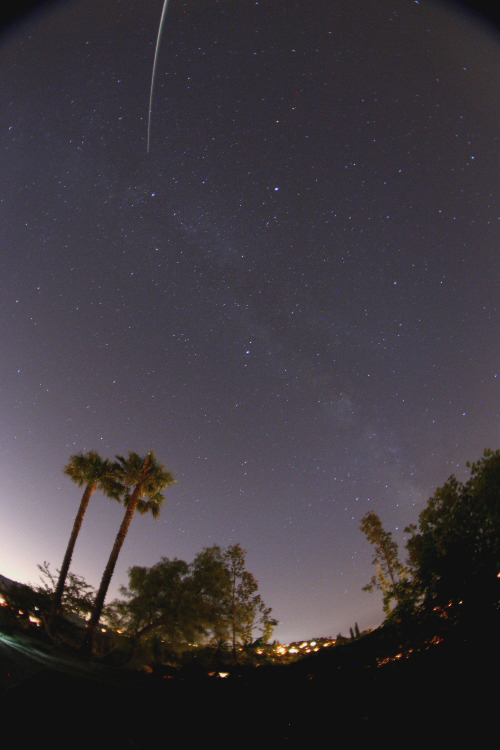 Just before dawn, I captured what turned out to be one of the brightest Perseids of the night. Perseus, the source of all the excitement, is visible at upper left in the photo, Orion has just risen, and the "false dawn," formed by a blend of zodiacal light and Milky Way, brightens the sky. 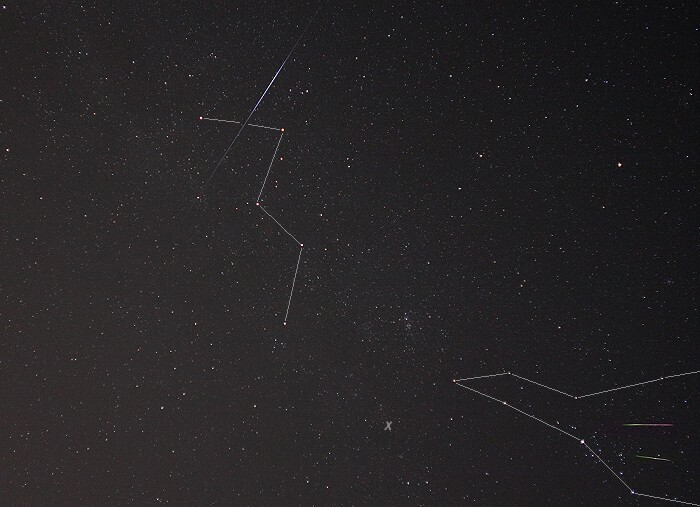 Tracing the trail of the meteor backwards leaves no doubt that this is a progeny of Perseus. This is a 4 minute piggyback-guided exposure with a Nikon FE2 camera and an f2.8 16 mm fl Nikkor lens taken on Fuji 800 color print film. Time of mid-exposure was 5:05 AM MDT on 8/12/08. I was set up in Stagecoach, Colorado, where the skies were clear and dark after moonset. 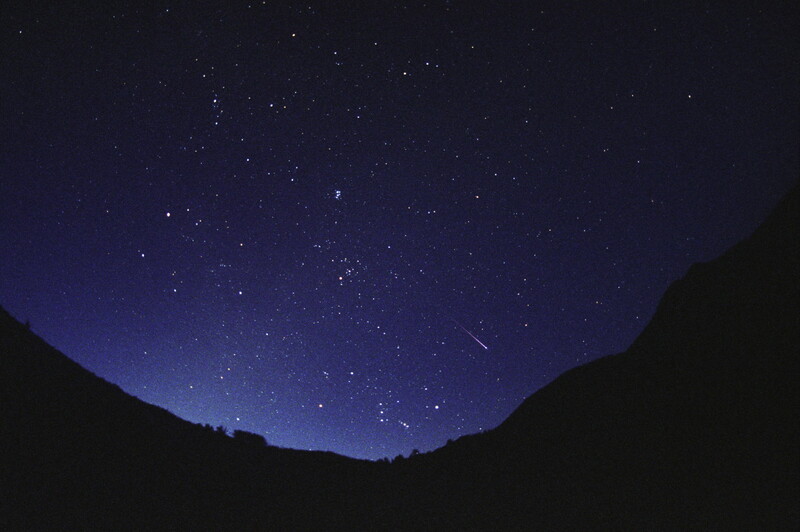 "X" marks the actual spot of the Perseid radiant on the morning of August 12, 2008. 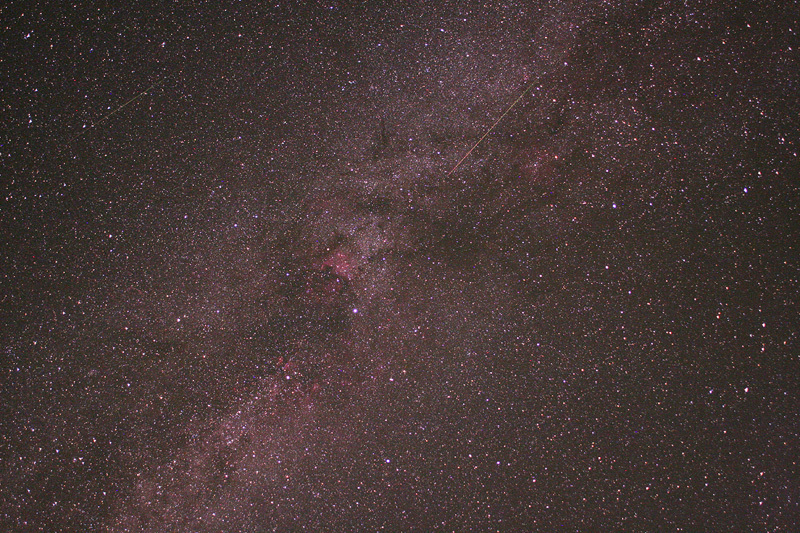 Two Perseids can be seen in the lower right of the photo in the upper portion of the constellation Perseus. The "W" represents the star pattern of Cassiopeia. The "blue meteor" in Cassiopeia is really an Iridium communications satellite flaring in the sun's early morning light. This is a composite image created from three 30 second photos, combined into one.